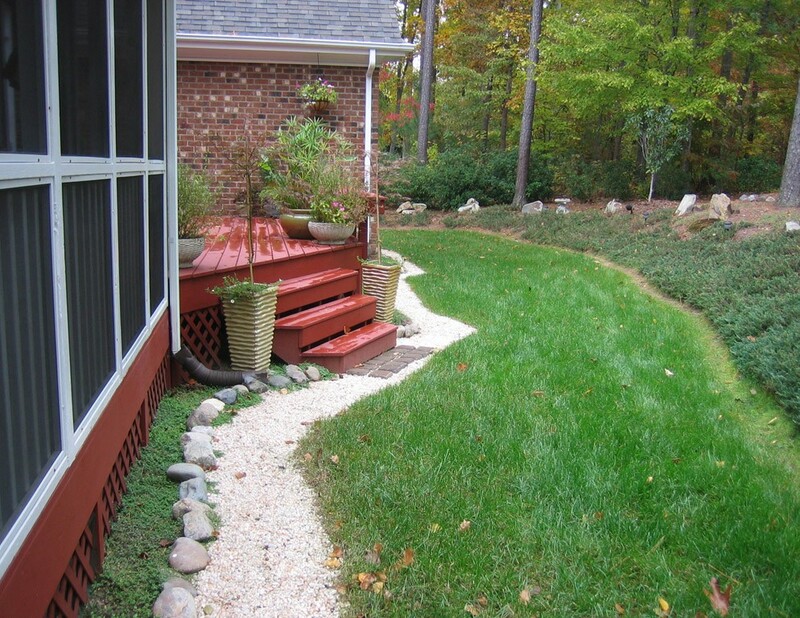 Our client was a talented artist whose existing landscape reflected little creativity. 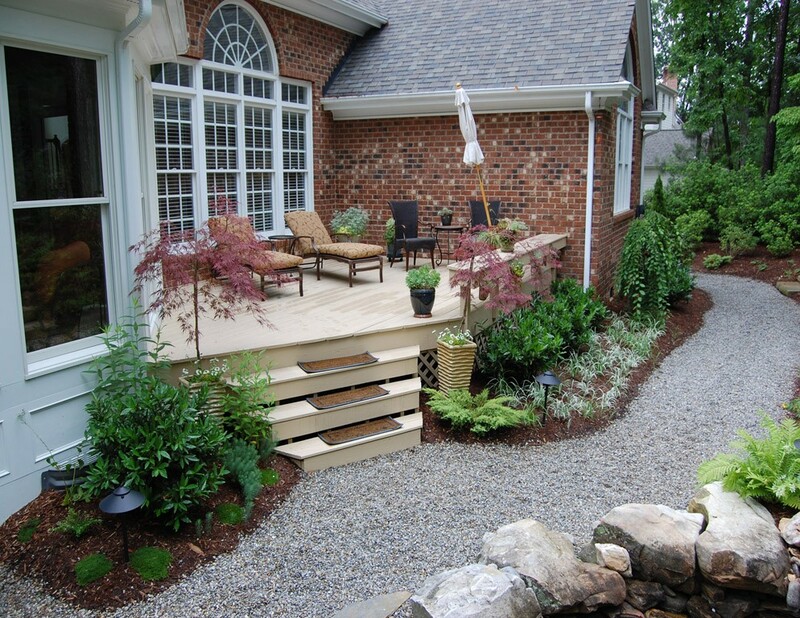 They desired a space where they could enjoy a view that not only reminded them of the mountains, but that inspired and restored as well. 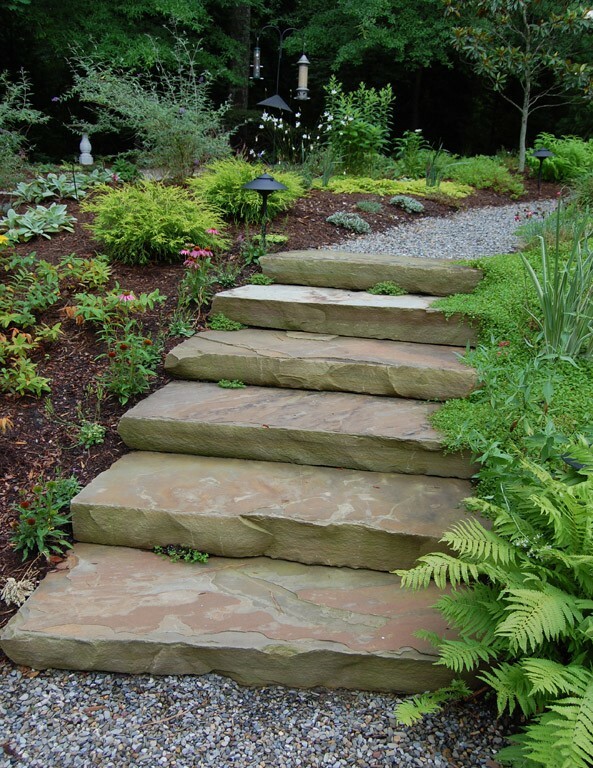 They wanted to experience nature and for their landscape to invite visitors into the garden. 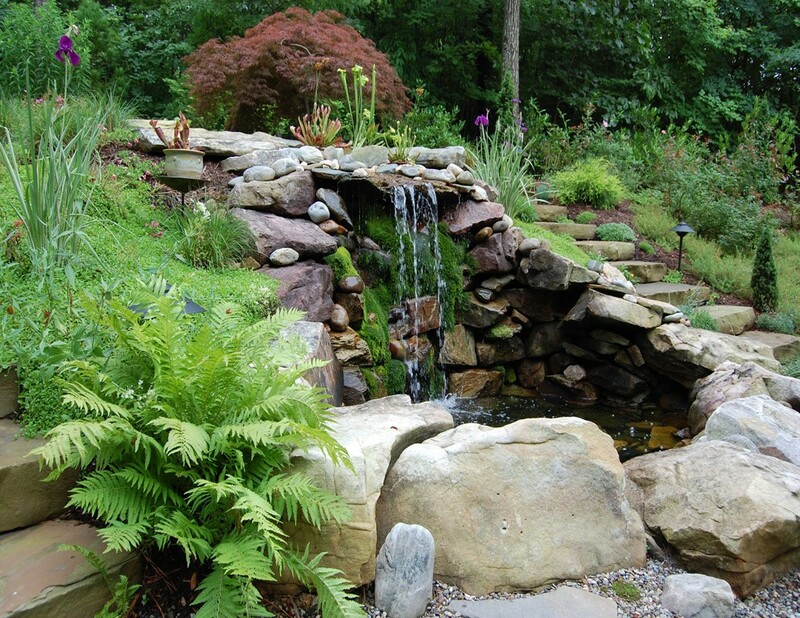 The initial landscape had a few pathways on the flat top of the hill, but were made up of various stones and gravels as well as randomly scattered garden elements such as a garden bench, an arbor, and a non-functioning fountain. 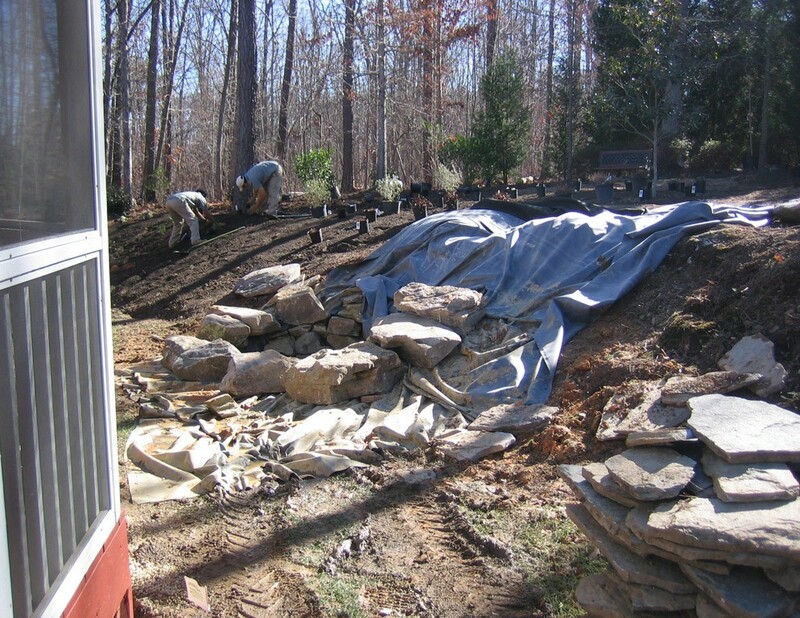 There was also no way to easily or safely reach the top of the hillside. 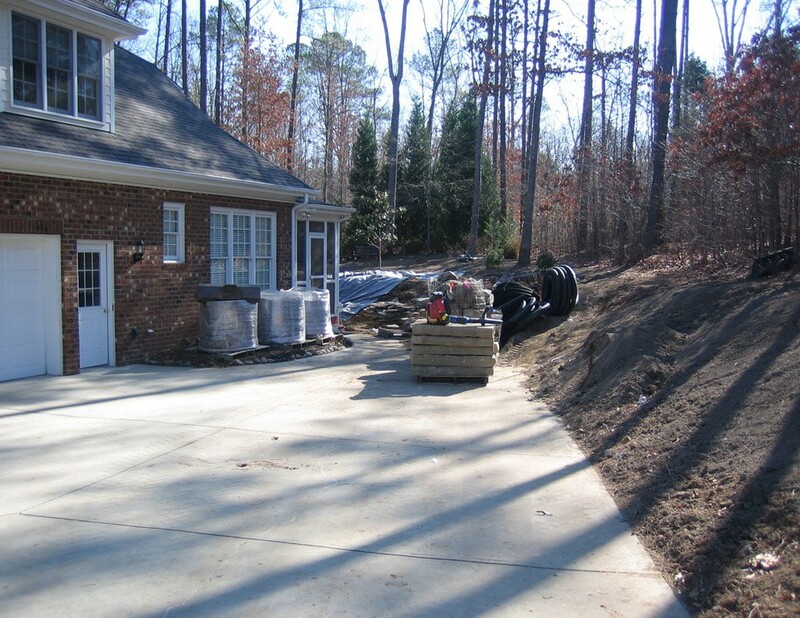 Water drained from the hillside and pooled at the foot of the house’s foundation, a problem that our clients wanted to address with the work. 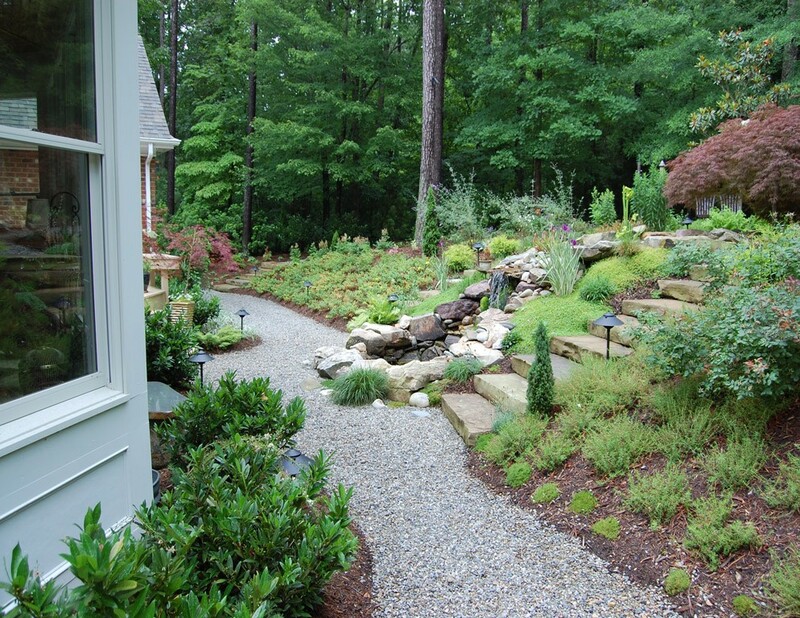 After determining the needs and wishes of our clients, we crafted a plan that would transform an existing, neglected landscape into one with a woodland-like feel that reflected the creative talents of their home. 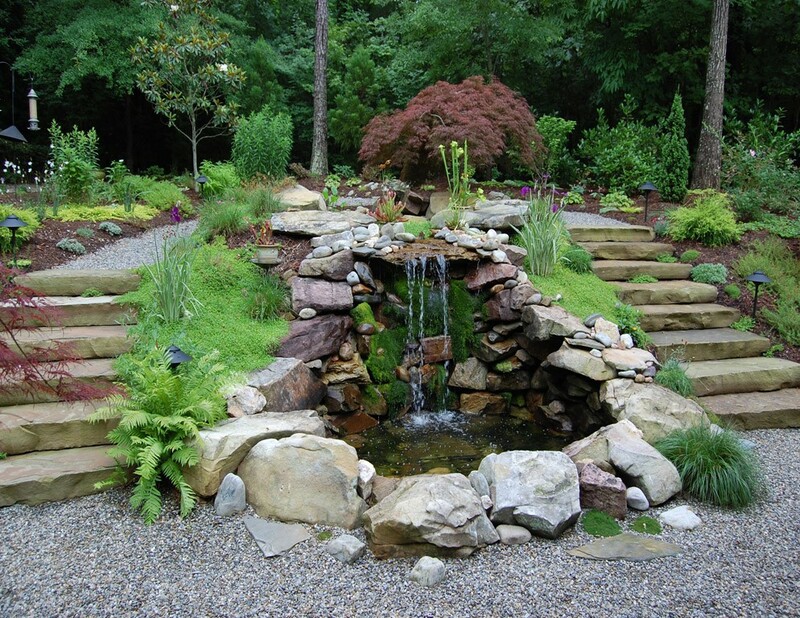 In order to achieve a garden with elements mirroring those of the mountains, our design included a mortared stacked stone wall entrance, various woodland plantings, rugged stone boulder steps, meandering gravel pathways, varying sizes of boulders, and a glorious waterfall complete with upper and lower pools. 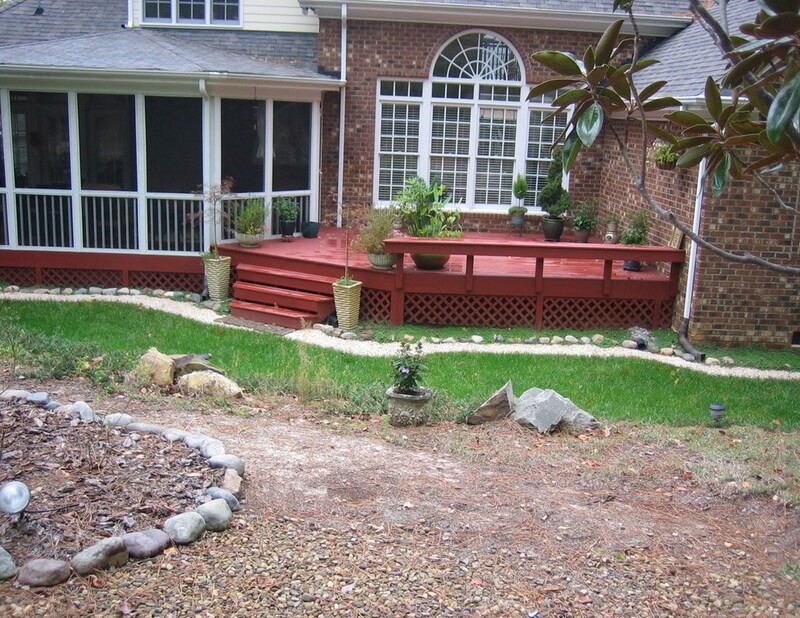 In order for the homeowners to enjoy their garden year-round, we worked with a sub-contractor to transform their screened in porch to a sunroom. 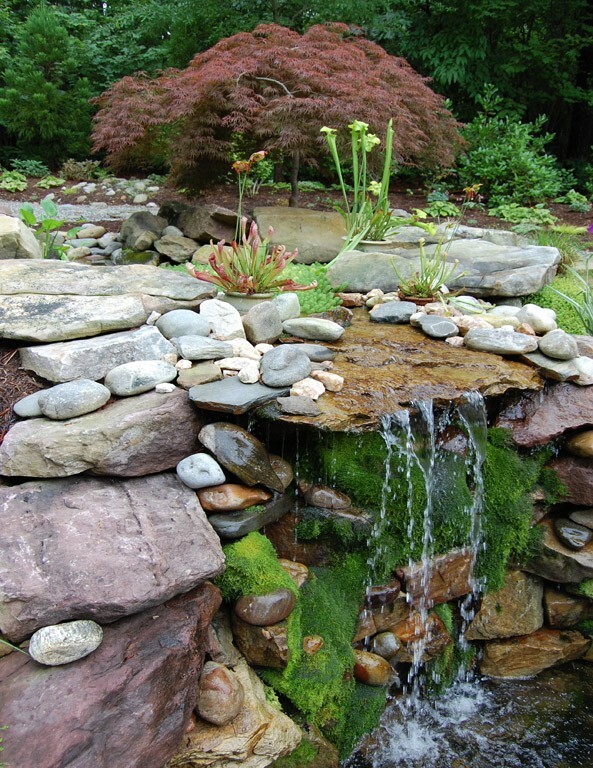 We also wanted the waterfall to be the main focus of the garden, so we suggested painting the red deck and trim a more subtle color that blended with the natural colors of the stones. 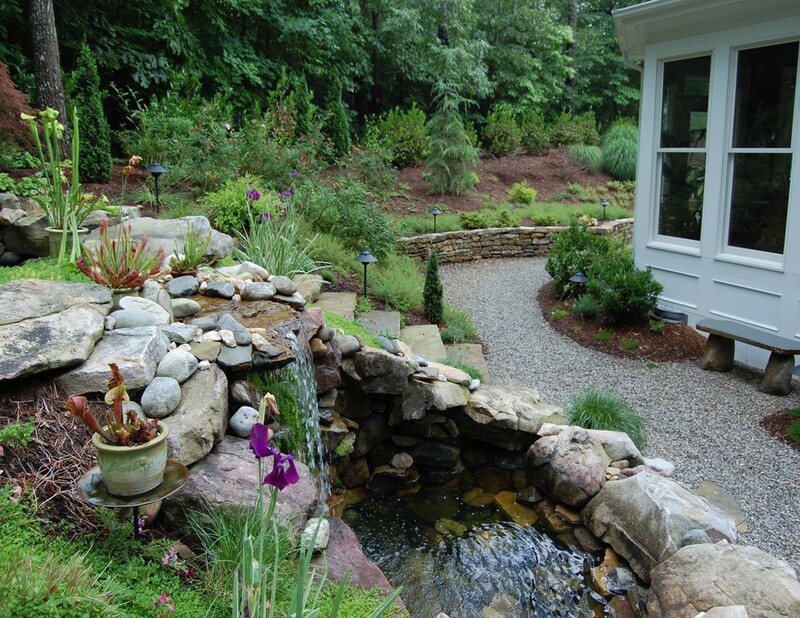 Careful consideration was taken regarding the exact location of the water feature so that it could be seen from the upstairs art studio as well as other views from inside the home. 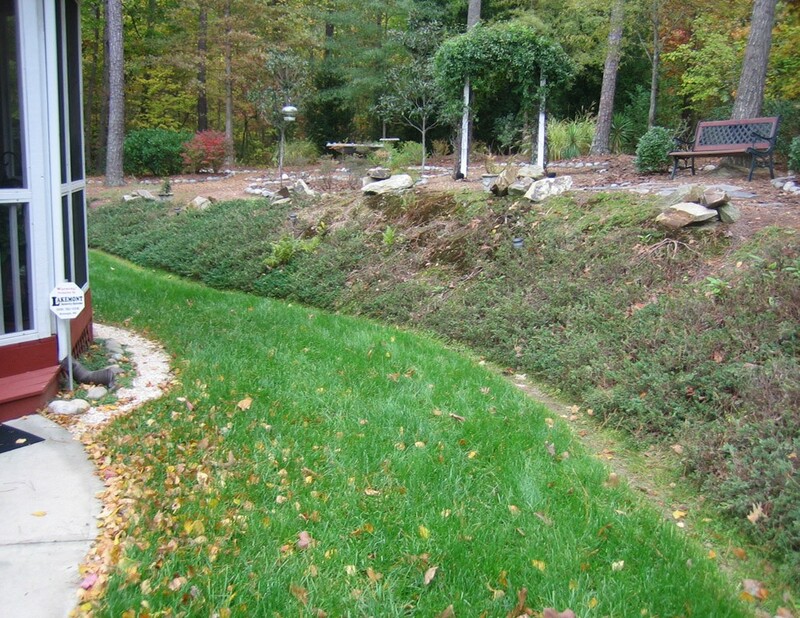 Since the water drains off the hillside and pools at the base of the house’s foundation, we installed a French drain with river rock gravel on top so that the water could filter through the stones and be piped out to a more appropriate location. 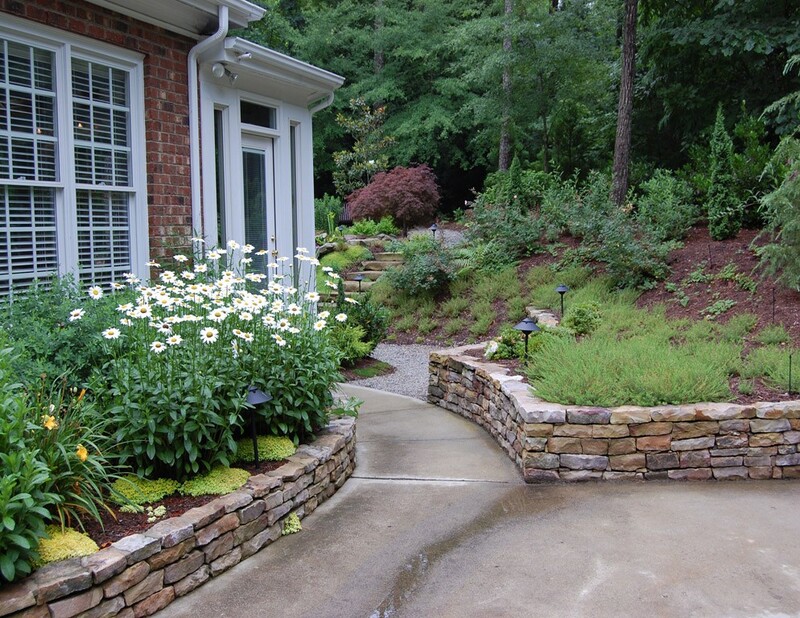 We also installed mortared stacked stone walls along with a catch basin at the end of the driveway to help alleviate the amount of water that flooded the back yard during hard rains. 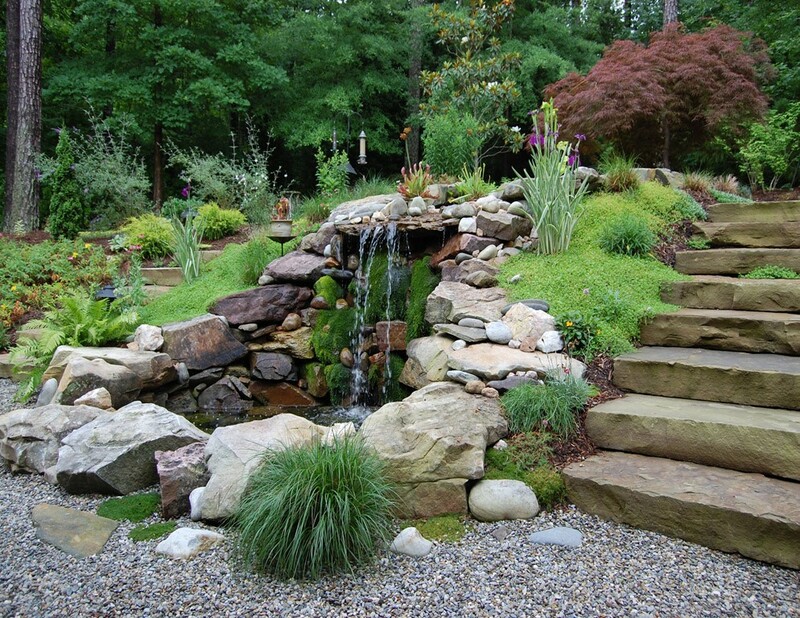 The hillside slope provided a perfect location to install a water feature with a natural fall. 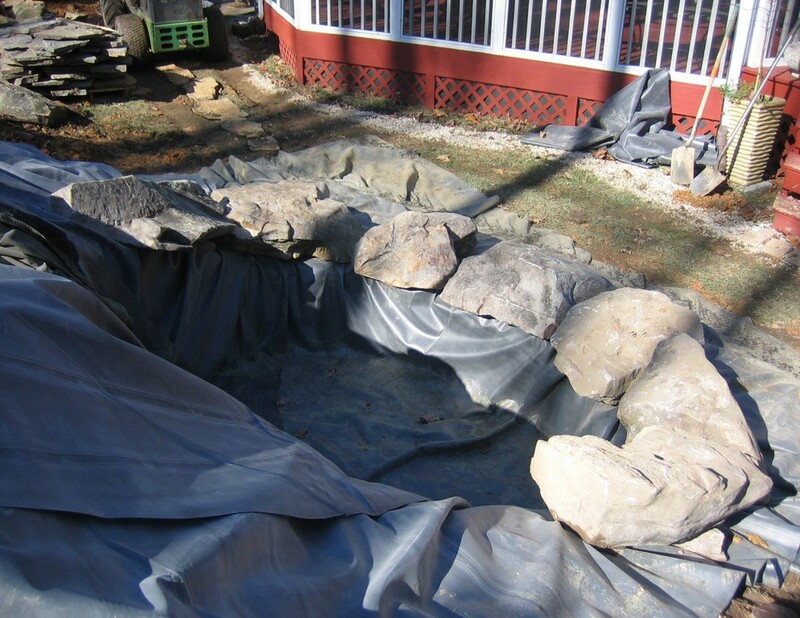 The crew installed an underlayment, pond liner, river rock, plumbing, pump, as well as carefully placed each stone and boulder to ensure that the waterfall had a mountainous look.